I'm in love with this gorgeous top from Dorothy Perkins - easy peasy glamour for this time of year, and more than anything it's very comforatble. I bought it to go with some black pencil trousers and they look fantastic for work. Perfect for after work Christmas drinks, and compared to others in the market this top is a bargain at £45. Got something quite art deco about it, which is all the rage after Gucci's SS12 collection a few weeks ago. Buy it here - you'll look fab in it! Absolutely adore this!! 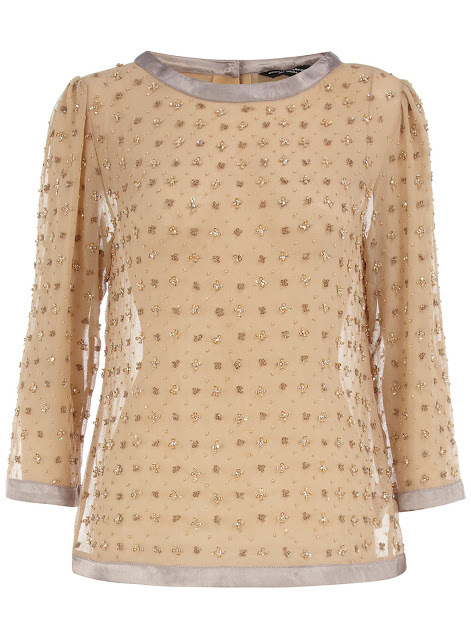 I am all about embellished tops atm....dont know what it is about them, those and dresses are what I'm lusting after....might be the fact its nearly christmas!! Good old DP. They really are coming up with some fabulous new designs again and again. I've been so impressed with their dresses this summer and winter. I am very much looking forward to returning to the UK so I can browse their stores again!